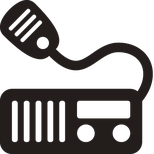 Radio Q-Codes are used to quickly communicate a question or idea as quickly as possible in a simple three letter code. Initially, Q-Codes can be may seem hard to learn, but after a bit of practice, they tend to stay in there and will eventually become second nature. If you are just listening or transmitting, these Q-Codes are important and worth the effort to learn. Tip: Print these codes, or open them on your PC so they are in front of you when you make those first contacts. QRM Interference from natural signals (like thunderstorms). QRN Interference from man-made sources.